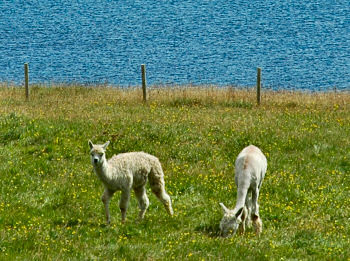 Here's a picture of animals you might not expect on Islay: Two alpacas. Most people would probably expect to see sheep and cattle on Islay, but not necessarily alpacas. These two (and a few more) live on a farm on near Port Charlotte (a mile or so towards Portnahaven). Is this yet another connection with Peru? After all alpacas come from the mountains of Peru. There's a place called Islay Hill, sometimes shrouded in fog, near San Luis Obispo in California, USA. I don't know if there is any connection to the Isle of Islay, although I guess it might have been named by emigrants from Islay. And funnily enough there is an Islay Hill Alpaca Ranch where they keep 16 alpacas, as the name suggests.